Many of the formulas shared here don’t require much in the way of supplies and tools, with the exception of the basic ingredients. 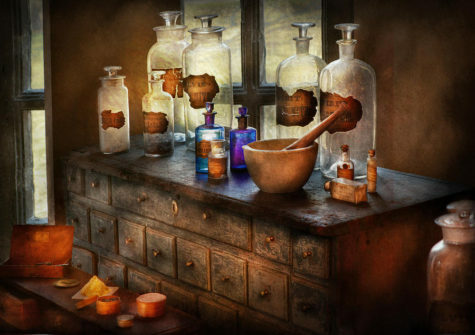 However, to prepare and engage in ALL the recipes, formulations, potions, and powders shared here at the Magickal Apothecary, you will need a wide selection of basic supplies. Over time, you will add to these supplies, but the following list will give you a good start. Some of these items can be found in thrift stores or garage sales, and the rest can be found on Amazon.com or at your local magick or herb shop. Jars and Bottles: You can never have enough jars and bottles in which to store your creations! Wide mouth jars are necessary for incenses and herbs, for easy storage and removal. A 4 or 6 oz jar should be sufficient for most incense storage, and you will find that recycled baby food jars or small food jars that once contained relish or other condiments are perfect. Brown Paper Bags: If you store large quantities of dried herbs, you may wish to simply keep each of them in a separate brown paper bag, like a paper grocery bag. As long as you keep the bags from getting wet and away from unnecessary heat, they will work just fine for dried herbs and resins. Vials: You will need laboratory grade glass vials for your essential oils and essential oil blends. When you purchase an essential oil it will come in a laboratory grade vial. It is helpful to have a selection of varying sizes in your vials from 1 dram up to 8 oz. For most oil blends, you will find that one dram 2 dram, and 1/2 oz vials are perfect. If you make massage oil, a 4 oz bottle should be sufficient, and you may prefer to keep that oil in a plastic bottle with a squeeze top for safety. A slippery oily hand can cause you to drop and break a glass bottle. Dropper Bottles: You will need at least one 1 oz bottle that has a dropper cap to store alcohol. This bottle is used for dispersing drops of essential oil without contaminating the contents of your essential oil bottles. Using the dropper you can count exactly how many drops of oil you are adding at any given time. Cleaning out the dropper by drawing some alcohol into the dropper then shaking out excess alcohol in between applications of the different oils you are using ensures that you don’t inadvertently get any essential oils mixed into other essential oil bottles, keeping the scents pure. You just want to be sure that before drawing up a new essential oil into the dropper that you shake all the alcohol out of the dropper. If you drip alcohol into your essential oil, it can make it cloudy. Labels: Keep a supply of sticky backed labels on hand so you can label everything as you make it. You may think that you will remember what a particular bottle or jar contains, but I guarantee you won’t. Labels are available at all office supply stores and often at the grocery store as well. Journal: Invest now in a journal or notebook in which you can record any original recipe blends that you create. You may not believe me now, but the first time you make the most marvelous blend of your life, then want to recreate it from memory, you will wish fervently that you had written it down. Mortar and Pestle: The mortar is the bowl that contains the herb or resin that you are crushing; the pestle is the rounded implement with which you crush. Glass or ceramic mortars work best as they do not react with any herb, oil, or resin and are easy to clean. Soapstone mortars are iffy as they are porous and can absorb essential oils into their surface. Metal mortar and pestles can react with some herbs and oils and become discolored. A mortar that is at least 3 inches is the smallest size that is useful, larger is better. Food Processor: A food processor can be used as a substitute for a mortar and pestle in a pinch. Be aware, however, that you should not add any resins to your mixture while it is in the processor. The heat from the moving blades will soften the resin enough to cause it to adhere to the blades and the interior of the food processor, and besides being really hard to clean up, it can burn up the motor in the food processor if there is a lot of resin in the mix. Glass, Enamel, and Ceramic Bowls: You will need at least one cereal size bowl in which to blend Bath Salts. Essential oils can react to metal, so you want your bowl to be made from a nonporous, neutral material.